Mikey, you're a writer as well as an art-tist! Messin' with Skunks is like changin' oil. Some is always going to get on you. Kind of like applying RTV black to any surface. Seems as though A lesser amount always gets applied to you as well. It's like greasing anything. Might as well just grease yourself and get it over. And like anytime something sticky and greasy and nasty is all over your hands. That is the exact time a sweat bee or a horsefly will choose to bite ya'. Conclusion: Messing with some things is just not going to happen without consequences! I think I just came up with some quotable wisdom for the "Book of Don," but this time it is derived from the ongoing "Mikey Story"
Great writing... Almost like you teach and stuff... Smooth! I love when you read something for the first time but it rolls off your tongue as if you are speaking it yourself! Tell me sir, did I sense some "elements of style" there? Was there a bit of Strunk in your story of the skunk? "Element of Style" - I recall that book vaguely from College writing class! Caliber, you're no slouch as a writer yourself; imagine you like to sneak some spice n humor into your "reports" at the end of your shift just to see who reads the stuff! Thanks for the compliment & have a safe shift- how's progress on Fortress Caliber going? funny story, so did the MRS put a cot for you in the garage or are you sleeping on some blankets? No cot necessary- I didn't get hit one bit, due to the prophylactic use of the first garbage bag! When you're that close, the molecular structure of said stink is like cockle burrs in your nose! I'm still catching a faint whiff here and there- garage doors are opened to air out. Have you noticed how when you drive by one on the side of the road how the stink clings inside the car? Open the windows and it's gone! It's not that the stench reaches that far, just a small pocket of polluted air hitches a ride with you for a mile or so! No longer smell it at the site of the battle, just some pockets of calm air lingering around the house! On Tate's proposed contraption- it would be great, but the rotting corpse would be worse than the spray! Had to go hammer, since .22 crack around 5am might rous the authorities- during my previous skunk war, there were less neighbors in the development and construction dumpsters for use as my morgue. Trap and shoot for good measure were the method then- used a milk jug over the end of the barrel to suppress the report and nobody was the wiser and those living close by weren't prone to take offense from Red Neck methods of dispatch. Current batch I'm not as familiar with, so I error on the side of caution so that I can maintain my CC permit! Hammers work well, and faster than worrying where the round may go. It's coming along... The basement is framed in and the main level is decked for framing. I'm back home (in TX) for a few days. Can't wait to see how fm far along she is when I get back! Tate, You can always get or make one of these. I will have to break mine out again this summer since the little rascals seem to be making a come back. Heard there was going to be some explosive relocating of trespassers happening. When is the fun? Gotta love those "traps" that were left afterward! Oh man! Well told! Glad the smell is gone. That smell is just the nastiest when delivered from point blank range. My house has a walkout basement. Well one night about midnight.....everyone's in bed. The GSD wants out....so I open the back door (level 1). She goes tear a**ing out the door, down the steps and down toward the back yard after something....I run to the bathroom right off the hall look out and see a skunk on the patio. Yeesh....this will not end well. I yell for her and she skids to a stop and comes right back in the house (thank gawd). Now I gotta figure out how to get this skunk to leave without stinking up the joint. Hmmm.....my feeble mind thinks "water"...that'll do it. So I go in the kitchen....get the stock pot....fill it up....go back to the bathroom window. Now the skunk is right below me 1 story down still nosing around. So I let fly with about 2-1/2 gallons of water. Oops....bad idea. I swear there was still water leaving the pan when I could smell that mr. Skunk decided water was an imminent attack and spraying was going to work! Yikes!! And of course it's one of those really hot humid nights with air just dripping. I slam the bathroom window....run in the kitchen and slam that one. By the time I get upstairs to close the window in the bathroom up there (also on the back of the house) the smell was so bad it woke up my wife from the bedroom on the front of the house. I mean all this happened in about 15 seconds and it woke her out of a sound sleep. She responded as she normally does whenever I am sprinting panicked through the house...."what did you do?" Ha. She knows me too well. Fortunately the smell disapated after a day or so but lesson #1 for me was don't pour water on skunks. Lesson #2 I learned from my son when he was about 5. Don't kick dead skunks no matter how much you want to. (He won't ever again although that may have had more to do with my wife making him strip naked on the back steps I dunno). Did I say I hate skunks? Although I did see the weirdest skunk behavior ever one night driving home. It was right down the street from the house and a whole ball of skunks (literally....about 4 or 5 or 6 skunks...I really don't know how many it was) were all wrapped up in a ball rolling across the road. My first thought was darn I can get rid of a bunch of skunks here as I started to swerve toward them...but some smarter brain cells kicked in and said "hey dummy....you'll have to burn your vehicle to get rid of the smell!!" So I just watched them....and then quickly drove by them. I still have no idea how normal or weird that particular form of skunk behavior is. Wilbur- you mean you'd never seen a group of skunks "having a ball" before? LOL! ^^^I just knew that story would start a whole plethora of "Ball" jokes! And if I had to guess I have chosen Mikey to be the ring leader! Its all mikeys fault, he did it. I know I know.....I started it. Ha! Hmmm....D.O.T. (Derailleur of Threads) is a term coined by this site some time ago. Used to describe those undisciplined, unruly, out of control, adolescent minded, good for nuttins' who inhabit our site here! Is this solution even legal? Thought someone told me you weren't allowed to own those. So I've always used a one shot air bb gun. Actually just got a rabbit center mass with it 2 days ago. We have a huge overpopulation of them this year and they are destroying the garden. My 4 year old son was ecstatic since this was his first experience with "hunting". He kept yelling "you got it! you got it! ... can I touch it?". And then followed up with "can we eat it?!?". So that was a good opportunity to explain some of the rules and have a conversation about respect for the animals you are hunting. Is this solution even legal? Thought someone told me you weren't allowed to own those. 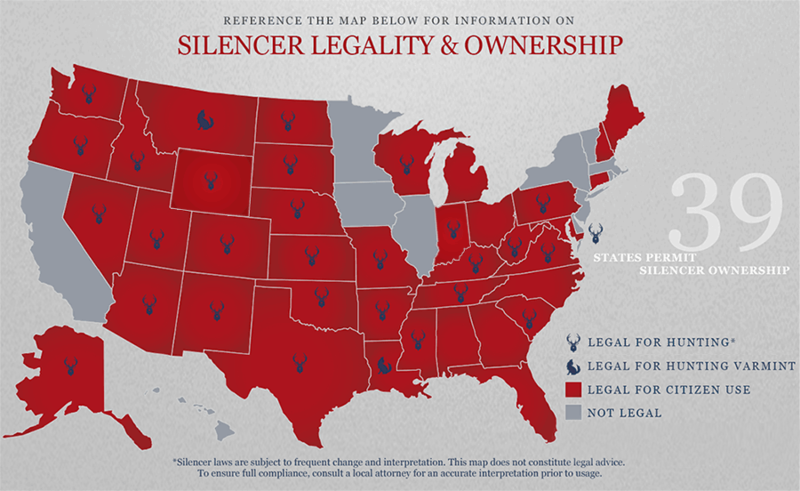 I don't know about subsonic ammo but more states than not allow silencers. I think its a $200 fee to the feds but once you have that you can get one. Lots of states allow them for hunting also. I hate being left out of the "legal" ownership category! I believe it is your RIGHT. However the legality varies by state. I live in Texas. Most everything is legal here. Suppressors require a federal tax stamp and a Form 4. $200 for exercising your RIGHT.